Happy Tuesday friends! I have a super busy weekend filled with events, appointments, and a few DIY projects I am tackling around my house. I have been on a sanding and refinishing kick of a few items and I am so sore from it. My shoulders are getting a workout for sure. I just finished up refinishing my kitchen table and now I am in the process of stripping my Duncan Phyfe buffet and have a pretty good idea as to how I want it to look refinished. If you want to see how this project is going be sure to follow me on snapchat (lisa.murie) for all the behind the scenes on my DIY projects. I will be sharing them once I am completely done with a final reveal, but that may be a while!! All this talk about projects is what leads me to todays outfit. It's not a new combination, but it sure is a great fall transitional outfit. 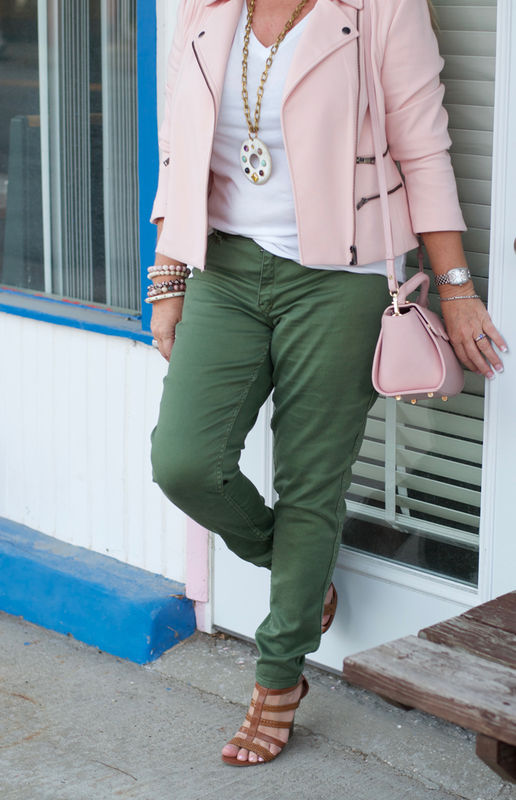 Bringing the best of summer with the blush pink and a gorgeous fall color with this army green it makes a perfect outfit. Taking two items I owned and giving them new life with a fresh twist. Kinda like the buffet project (I hope) ! I do think it's time to pack away my Mezzi pink bag for fall, but I had to give it one more spin before I did. 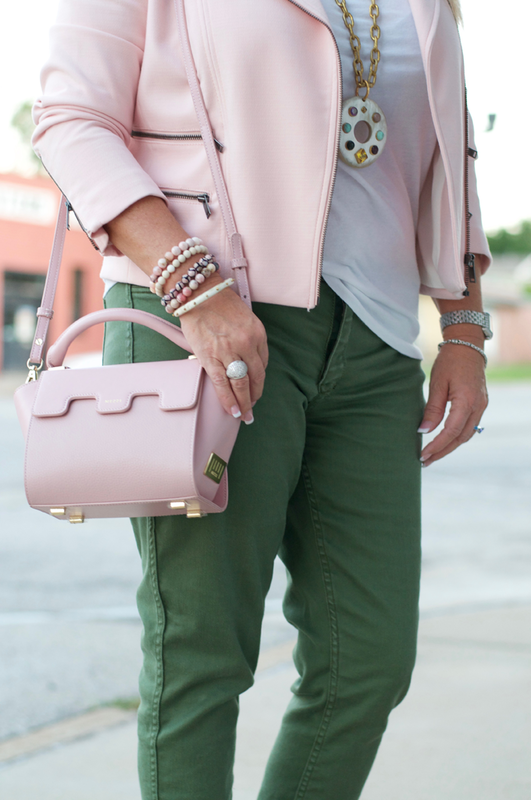 Style Tip: Mix your pastels in your outfits with a jewel tone color. You can add a scarf, dark denim like I have here, or even add a richer color in your handbag and jewelry. Have fun with it!